Welcome on board. From her elegant old Salon, breathtaking nature views, spacious sun decks. s/s Punkaharju will captivate you and your guests like no other charter yachts on the Lake. s/s Punkaharju is the oldest steamer still in business use, built 1905. 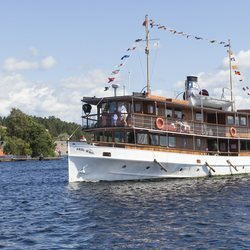 Discover the Finnish summer by shoreline cruise traveling through the gorgeous Saimaa Lakeland labyrinth. See the heart of the Saimaa Lake district and Savonlinna´s famous medieval Olavinlinna castle. 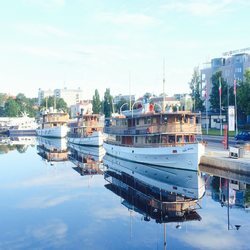 Sightseeing cruises by original Finnish handmade steamships S/S Paul Wahl, S/S Punkaharju and S/S Savonlinna offer you an insight into the history of a Finnish inland lake. 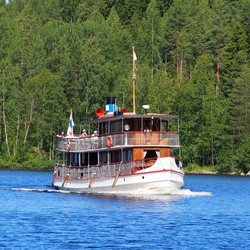 The fascinating Finnish national scenery combined with A traditional steamship is an unforgettable experience.